1. In a bowl, cream together the butter and sugar, then add the vanilla paste and self-raising flour; mix with a wooden spoon until combined. Form into a flat circle, wrap in cling film and chill for 30 minutes. 2. On a lightly floured surface, roll out the dough to a 0.5cm thickness. Use a 6cm cutter (we used a fluted cutter) to cut out circles, then a cutter of about 1-1.5cm, or the base of a small piping nozzle, to cut out a hole in the centre of ½ of the biscuits (these will be your tops). Repeat, re-rolling the leftover dough and centres together, until you have 16-18 tops and the same number of bases. Chill for 30 minutes on parchment-lined baking trays. Preheat the oven to 180°C, gas mark 4. 3. Once the circles have chilled, bake for 12 minutes, rotating each tray halfway, until golden. Leave on the trays for 5 minutes before moving to a wire rack to cool completely. 4. 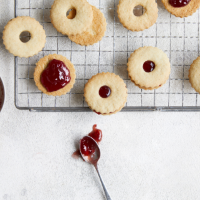 When cooled, spread a heaped tsp of jam onto each biscuit base, then sandwich together with one of the biscuit tops.